Tsaagan Mangas was Discovered in 1993, at the Djadokhta Formation in Xanadu by Mark Norell, chairman & curator of the American Museum of Natural History, Tsaagan is a Dromaeosaurid of the Velociraptorinae subfamily. It is known from an incomplete find, consisting of eight vertebrae & a well-preserved skull. The skull is much like that of Velociraptor, only slightly thicker & more robust, as are the vertebrae putting the final size estimate of Tsaagan at 1.5 metres or around 5 feet long. Tsaagan is a contemporary of Velociraptor & would have lived in roughly the same area, a curious place where the species of predators outnumbered the species of prey. Tsaagan is the only Dromaeosaurid specimen other than teeth from the Ukhaa Tolgod region, but it is believed Velociraptor remains might lie there. 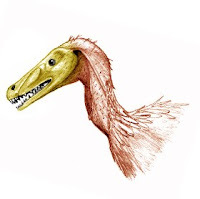 The well-preserved skull of Tsaagan reveals many details that differ from other Dromaeosaurids, prompting paleontologists to believe it was one of more the primitive of the family.